International Assistance Dog Week has a TV public service announcement (PSA). 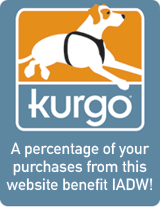 It tells people about IADW, gives them the dates and the website address, and shows them assistance dogs in action. The 30-second IADW PSA was created by Rick Huff of Some Stuff From Huff and :30 Second Street in Albuquerque, New Mexico, whose time and talents were donated. The video clips of assistance dogs performing various tasks were contributed by a number of Assistance Dog International member organizations. Assistance Dog organizations and individuals can embed the video from YouTube into their own websites. Just go to the Free Materials page to get the link. Besides the PSA, there are a number of other free materials on the page to help you promote your own IADW event. Or go to YouTube directly to watch the IADW TV PSA.